For a sugar rush like you’ve never experienced, this is the Melbourne dessert bar you can’t ignore! 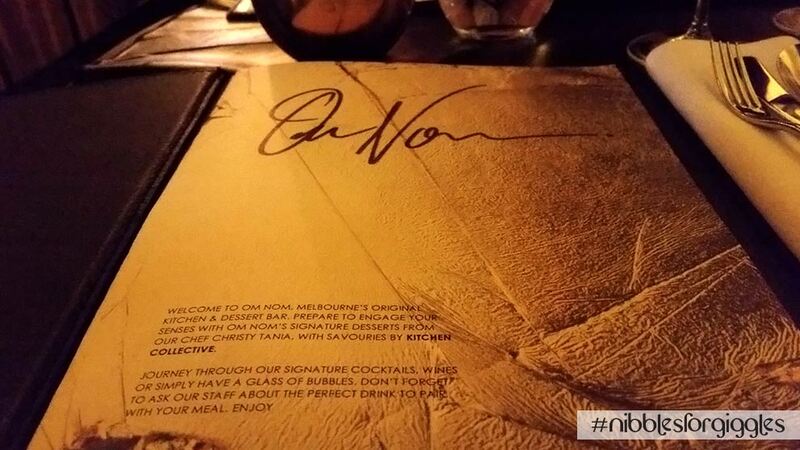 Om Nom is situated on the ground floor of Adelphi Hotel on Melbourne’s Flinders Lane. From the streets, Adelphi’s neon lights tease you into having a peak inside from the big glass windows, inviting you to come a little closer… Inside, you are presented with a modern interior, dim yellow lighting and a mixture of dining seats and comfortable couches surrounded by snazzy jazzy music. While the lighting was uncomfortably dark, the entire combination helps create a funky yet homely atmosphere. As we first entered, we mistakenly went to the Adelphi Hotel reception for our booking for Om Nom where we were kindly directed to the actual reception. Considering its location (right in-front of you when you walk in through the sliding door), we’re pretty sure every person makes the same mistake. We were promptly greeted and seated at our table, given menus and water to drink. When we were ready to order, our waitress came quickly and a sweet smile on her face. When we ordered, she laughed and said she would order exactly the same…perhaps with slight judgement, who knows, because we went for the dessert degustation menu – one each, of course – obviously the only way to do it. The service was generally pretty spot on, however at one point we were given the same dessert twice, it was as if they weren’t really keeping track of what we had eaten. 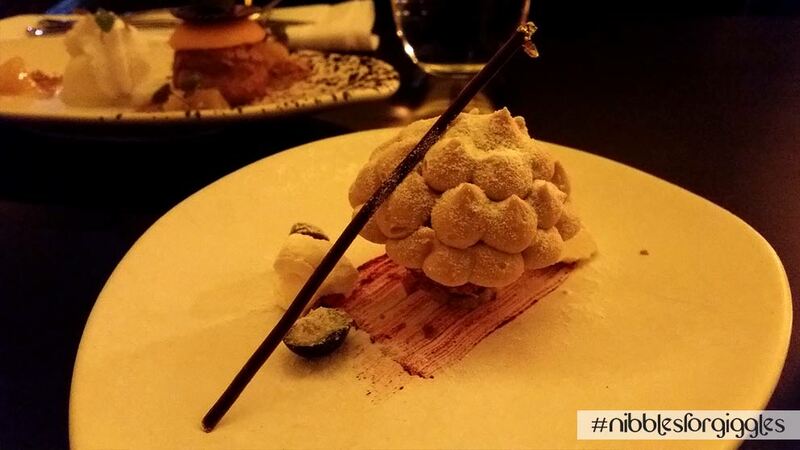 Mont Blanc – Meringue, dark chocolate, chestnut, vanilla, blackberry, feuilletine. 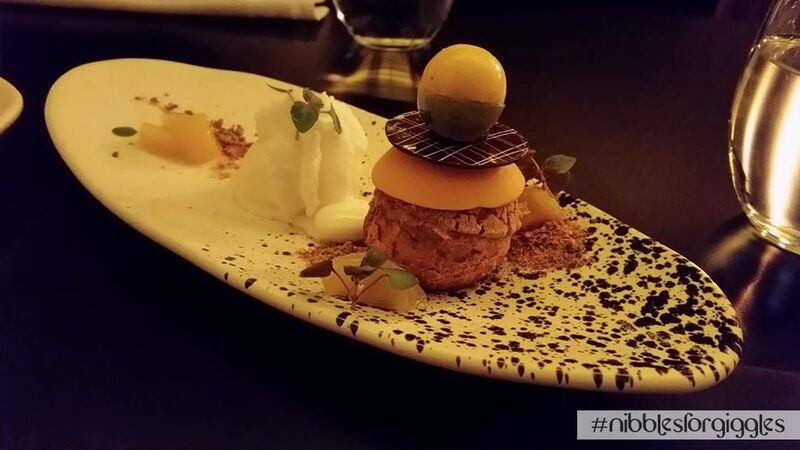 Mango Alfonso – Choux pastry, shiso, coconut, kalamansi, lemongrass ginger and caramelised white chocolate. Raspberry Field – Raspberry, lychee, meringue, rosewater. Tarte Tatin – Granny smith apple, 5 spice, chantily, vanilla, lemongrass and ginger. Kolak Pisang – Caramelized banana, sweet potato & coconut broth, with caramel coconut sugar, pandan and sweet spiced ice cream. 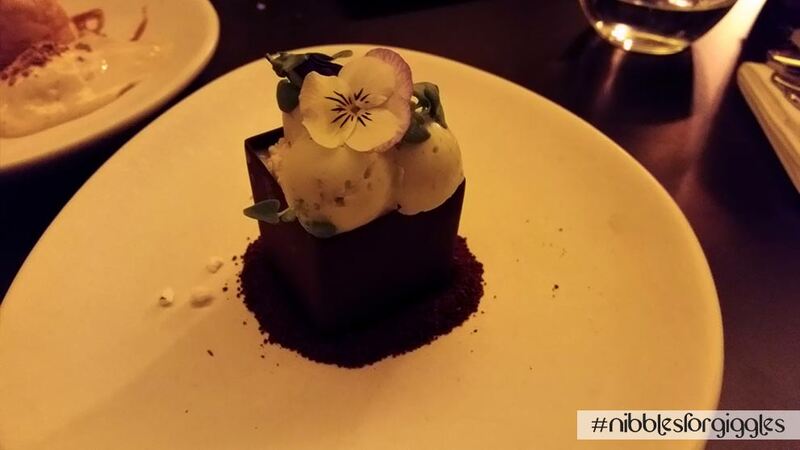 Basil Garden – Dark chocolate, vanilla, olive oil, honey, basil, lime, white chocolate and meringue. The Mont Blanc was the first to come out and looked visually appetising – beautifully crafted to replicate an acorn. The seemingly stiff outer shell was remarkably soft, fluffy ice cream. When you cut into the succulent creaminess, your knife hit the meringue which was hidden in the middle with the other elements that compose this dessert. The softness of the ice cream complimented the hard texture of the meringue while the bitterness of dark chocolate helped ease up the overall sweetness. We both agreed this was a nice start to the degustation – all flavours came together very well. The Mango Alfonso was next. This is the dessert best known for being on this year’s Masterchef Australia. It looked slightly different which meant it has been changed slightly since making its appearance in the series but still, it does taste as good as it looks. 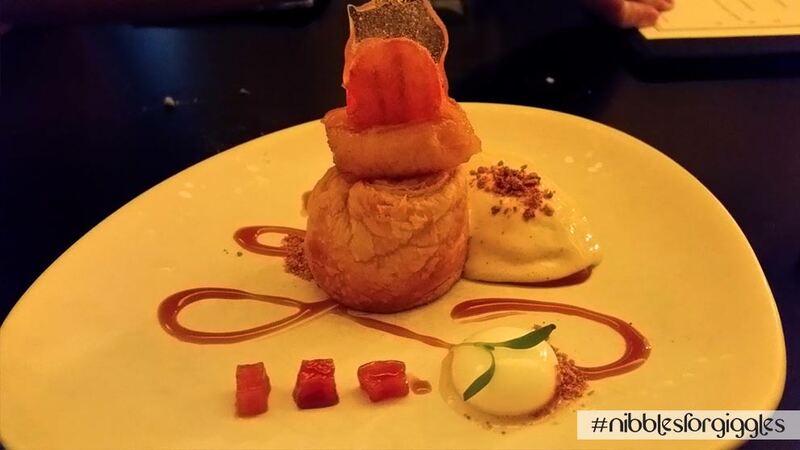 The choux pastry was exceptionally made – super crisp on the outside and the kalamansi sorbet which just melted in your mouth was the stand out that brought the dish together perfectly, although we had to eat the sorbet quick or we would have been drinking it up! Two desserts down, we were even more excited than when we arrived. Expectations had increased and the very well plated Raspberry Garden was then put in front of us. It was visually a fantastic dessert, however, taste wise – it just wasn’t as impressive as the previous two. 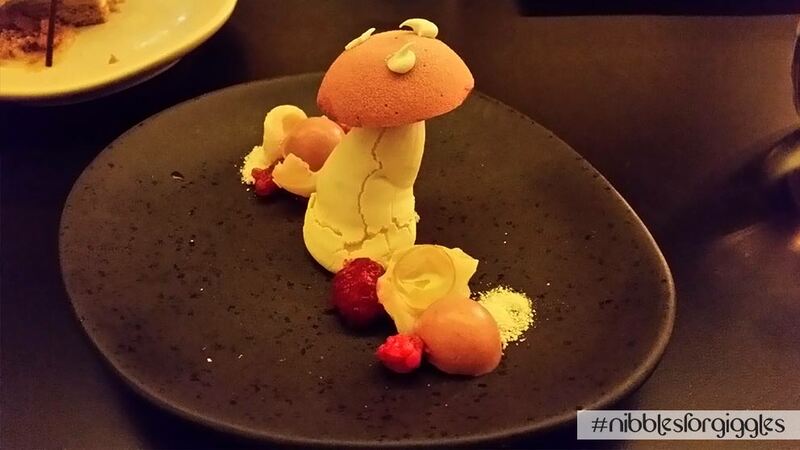 The top of the ‘mushroom’ was a raspberry sorbet and the stalk was the meringue. Although we like sweet desserts, this was perhaps a little too sweet and the rosewater didn’t quite do enough to bring down the sweetness of the meringue and sorbet. Such a shame when your food looks so stunning. Our slight disappointment was very quickly negated with the Tarte Tatin – what a dessert! This was probably our favourite in terms of taste and flavour. What we would say is that it was probably the poorest plated dish. The plating was a little sloppy as you can see from the picture. The apple was cooked through perfectly and you could taste the 5 spice. The base was was quite hard to cut but was just right when combined with the apple and the chantily cream. The lemongrass and ginger ball was a delight when the liquidy goodness just burst in your mouth. This kind of technique was a pleasure to try and exciting when you take that first bite. The penultimate dessert which came our way was the Kolak Pisang. The sweet potato and coconut broth was superb – just a shame there wasn’t that much of it! Together with the pandan and the ice cream, it was absolutely scrumptious. It was not without flaws though, the caramel coconut sugar was quite thick meaning it was a little hard on the teeth when trying to eat it so that wasn’t as pleasant, and you didn’t get much at all of the caramlised banana which was a shame. Finally we come to the end, the Basil Garden. A handcrafted dark chocolate base with a number of flavours in the center with basil being the standout. This was a bit of a let down – the techniques in making this are great, but the basil just did not fully do it for us. We might have actually preferred it to be a mint garden. I know you need to push the boat out to make an exceptional dessert, but just sometimes, the classic flavours work best. Dark chocolate and mint to end a degustation may have been a better option. All in all, this was exciting and enjoyable all at one. 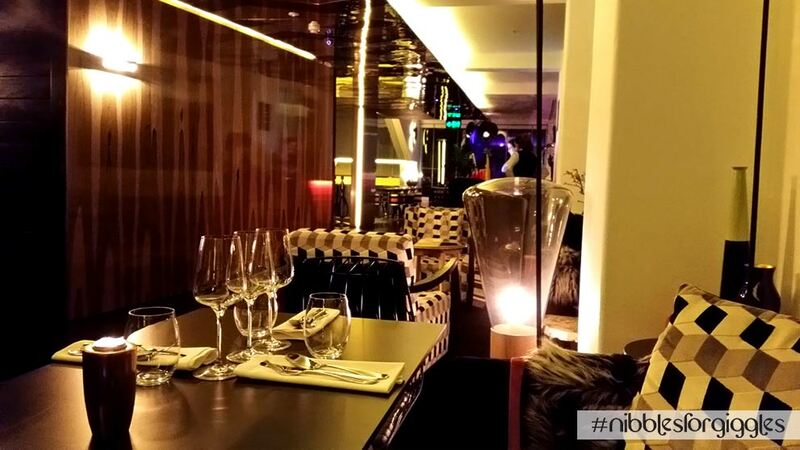 The degustation menu is a great thing to do if you want to try a number of the desserts…and when they are desserts of the highest calibre, the degustation option becomes even more appealing. The portions are smaller than if you go for an individual dessert which allows you to try a number of them. One dessert we didn’t get to try as it was not part of the degustation menu but looked fantastic, was the Caramalised Smoked Banoffie – perhaps there might be a second visit for this one. All dishes were plated and crafted beautifully however, not all dishes met expectations unfortunately – the saying ‘Don’t judge a book by its cover’ rings true with our experience here. Despite that, we would certainly recommend this to any dessert lovers out there, it’s definitely worth coming for a sweet feast! Very nice plating & presentation in general! The chou especially looks lovely. Love a good Tarte Tatin, that one looks a bit on the less caramelized side though. Definitely a great place to go even if just for the presentation!